Democrats and Republicans have created a health care system in the USA over the last 40 years that “burns toast” at an alarming rate. As the symptoms of their health care system are displayed they call in people to blame for burning toast. Their participation in the “you burn, I’ll scrape” system is even worse than the normal burning then scraping process. They create a bad system over decades and ignore the burnt toast just telling people to put up with it. And when some burnt toast can’t be ignored any longer they then blame individuals for each piece of burnt toast. They demand that those they bring before them to blame, scrape off the burnt toast. And they act shocked that the “toaster” burns toast. It is the same “toaster” they designed and maintain at the behest of those benefiting from burnt toast and of course it burns toast (those results are the natural outcome of the system they designed and maintain). We need to fix the decades old broken toaster that the Democrats and Republicans built and have maintained. Dr. Deming called excessive healthcare costs a deadly disease decades ago yet Democrats and Republicans allowed it to continue harming us year after year and decade after decade. We don’t need distractions blaming a few individual for what the two parties have created and maintained for decades. We need leaders to address the real issues and stop the distraction that those benefiting from the current system want to continue to see from those in Washington. You don’t fix the system if all you do is blame individuals for each piece of burnt toast. Fixing blame on each piece of burnt toast is exactly what those that have continued to make sure the system is designed to continually burn toast love to see. It is a good way to make sure the fixes needed to the design of the toaster are not addressed. Both political parties have done well by those they receive payments from to ensure that the current toaster isn’t changed. For decades the data shows the USA health care system costs are nearly double that of other rich countries with no better results. And we are not comparing to some perfect ideal, those efforts we compare to need much improvement themselves. So how bad much the USA health care system be to cost nearly twice as much as those systems that have plenty of room for improvement themselves? This entry was posted in Economics, Health care, Management, Public Sector and tagged blame, Economics, global, government, health care system, organization as a system on October 4, 2016 by John Hunter. Decades ago W. Edwards Deming named 7 deadly diseases of western management. One of those was excessive health care costs. Sadly that deadly disease has become much worse in the last several decades. Xtandi, a prostate cancer drug co-licenced by Japan’s Astellas Pharma and Medivation Inc. was developed at a U.S. university with grants funded by taxpayer dollars. That gives the federal government the right to revoke the patent if the terms are unreasonable, said the letter, dated Monday. “We do not think that charging U.S. residents more than anyone else in the world meets the obligation to make the invention available to U.S. residents on reasonable terms,” said the letter, which had Sen. and presidential candidate Bernie Sanders, Sen. Elizabeth Warren and Rep. Elijah Cummings among its signatories. This specific example also highlights what I classified as a new deadly disease in 2007 – the broken patent and trademark system. Both of these deadly diseases greatly damage the USA economy and the economic condition of USA citizens. It is disgraceful that the Democratic and Repulbican parties have allowed these deadly diseases to ravage the USA economy for decades. The drug price situation in the USA is greatly exsaserbated by the corrupt political process. Drug companies give large amounts of cash to those we elect and then those we elect create system that damage the USA economy and provide drug companies huge extra profits inside the USA (those profits then allow the companies to charge other countries even less and still make a great return on their investment). I wrote about this in 2005: Excessive Drug Prices in the USA (and several times since then, Drug Price Crisis  – it is a long term, huge economic problem for the USA). Health care is extremely expensive everywhere. But in the USA the health care system is twice as costly as other rich countries. This is an enormous burden on the USA economy. Nothing else comes close to being as costly in terms of direct spending. And there a a great deal of other damage done that can’t be seen in just the 100% more the USA spends on health care than other rich countries spend. And the health outcomes are no better for the extra hundres of billions of dollars spent every year for health care in the USA. The costs of decades of failure are extrodinary. We shouldn’t allow the political parties to continue to fail to sensibly address these problems. Even if we can just get to the point of costing 50% more than other rich countries our economy will be greatly enhanced, but we have not even been able to reduce the health care tax the USA health care system puts on us to just 50% more than other countries. That is a pretty sad state of affairs especially when you consider that other countries are not doing a great job – so we are twice as costly, not as some extremely wonderful amazing system but twice as costly as mediocre comparisons. Extremely inflatted drug prices in the USA are a significant part of the problem but still only a portion of a system that has been costly the USA economy and citizens hundreds of billions of dollars a year (and untold soffuering in many other ways) for decades. We have to do better. This entry was posted in Competition, Economics, Health care and tagged deadly diseases, Deming, Economics, government, Health care, patent on March 30, 2016 by John Hunter. I am disgusted by the lack of ethical and moral fiber of CEO’s (along with their cronies and apologists) in the USA. This lack comes out in many ways (see all the scandals at the too-big-to-fail banks etc.) but the problem I am upset about now is the increasingly commonplace kleptocrat behavior. CEOs, and their cronies, were well paid decades ago. As their greed about their pay got to be unethical Peter Drucker started to speak out against their ethical failures. As those abuses became more extreme he increased his objections. What Peter Drucker railed against was minor compared to the ethical meltdowns we allow in those serving in executive positions today. The average ratio for the S&P 500 companies is up from 170 in 2009, when the financial crisis reduced many compensation packages. Estimates by academics and trade-union groups put the number at 20-to-1 in the 1950s, rising to 42-to-1 in 1980 and 120-to-1 by 2000. These CEOs act like kleptocrat dictators, taking what they can and challenging anyone to do anything about it. As with the kleptocrats they surround themselves with apologists and spread around the looting (from corporate treasuries for the CEO and the countries for the dictators) to those that support their kleptocrat ways. This entry was posted in Economics, Investing, Psychology and tagged business, commentary, ethics, executive pay, Investing, overpaid executives, respect for people on March 10, 2014 by John Hunter. I write primarily about management improvement on this blog – which makes sense given the title. In the very early days I had more on investing, economic data, science, engineering and travel. Then I created three new blogs (Curious Cat Investment and Economics Blog, Curious Cat Science and Engineering Blog, Curious Cat Travel Photos blog) and that made this blog more focused. Even so the lines of what fits where can be a bit fuzzy and I continue to write about manufacturing, and health care, with a focus on economic data, occasionally. And that is what I am doing today while touching on management related to manufacturing a bit. As I have written before the story of manufacturing in the USA, and globally, is greatly increased quality of processes and output as well as greatly improved productivity over the last few decades. 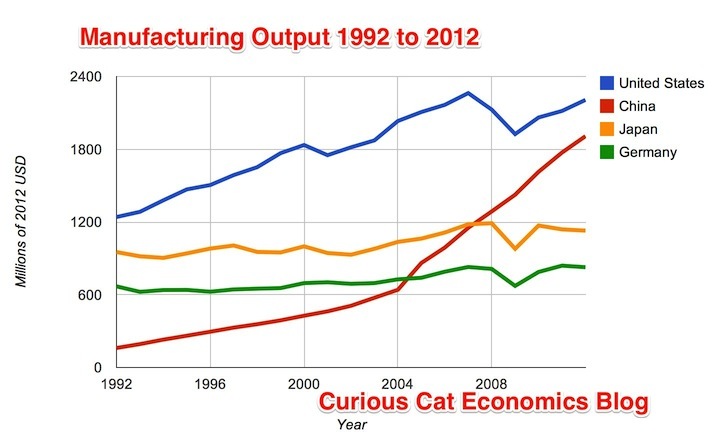 Manufacturing output also increased, including in the USA, as I have written consistently for a decade now. For example: (Top 10 Countries for Manufacturing Production from 1980 to 2010. Still many people have the notion that USA manufacturing has been declining, which hasn’t been true, and certainly isn’t true now (the last couple of years have been especially strong and even the general public seems to realize the idea of the USA losing manufacturing is a myth). Based on data from the UN. See my blog post on my economics for more details on the data (to be posted next week). The chart is impressive and illustrates the point I have been hammering home for years. The USA manufacturing base is growing and far from crumbling (job losses are deceiving as they are global and not an indication of a USA manufacturing decline). China’s manufacturing growth is incredible. China and the USA are far away the top 2 manufacturing countries. Japan and Germany make out the top 4 before a large gap which then is followed by a group of countries that are very close (Korea is 5th with less than half the production of Germany). This entry was posted in Economics, Manufacturing and tagged China, Data, economic data, economy, Germany, Japan, Manufacturing, USA on February 27, 2014 by John Hunter. I continue to record podcasts as I promote my new book – Management Matters: Building Enterprise Capability. In this podcast I discuss the 2 new deadly diseases facing companies. The second part of the Business 901 podcast will be posted soon. I have created a new subreddit for posting links to interesting items about the new deadly diseases for business. This entry was posted in Deming, Economics, Management and tagged copyright, Deming, Economics, government, John Hunter, management, overpaid executives, patent, podcast on February 4, 2013 by John Hunter. Developing a strong executive leadership culture is not a short term effort. It isn’t based on one person. It almost never deteriorates quickly. Yet markets continually overact to minor blips on the long term success of companies. I think this is mainly due to a failure to appreciate systems and a failure to appreciate variation along with plenty of other contributing factors. The market’s weakness does provide investment opportunities. Though taking advantages of them is much more difficult than spotting a general weakness. While excellent management almost never becomes pitiful overnight (regardless of how often talking heads would have you believe) business can change very quickly due to rapidly changing market conditions. Avoiding the purchases when the underlying business has sustained a significant blow that excellent management will deal with but which will reduce the value of the enterprise going forward is key to taking advantage of the market’s silly overreaction to bad news (or even calling things “bad news” that are not actually bad just not as awesome as some were hoping for). My positive opinion of Toyota’s management has continued for a long time. A few years ago an amazing number of people were all excited about the “decline of Toyota” and wrote about how Toyota’s ways had to change. I wrote at the time was this is needless hysteria and if Toyota just focused a bit more on applying the Toyota’s management methods they would be in great shape. The problems were due to Toyota’s mistakes in practicing the Toyota Production System not in a weakness of those practices. Looking at a chart of Toyota’s stock price from 2007 to today it peaks at about $137 in January 2007 and bottoms at $58 in early 2009 and now is at $96. Toyota’s stock price has been priced richly due to respect for management and consistently strong cash flow. As it fell below $75 there you no longer had to pay a premium for excellent management, but that management was still there. I like getting bargains when I buy stocks. One of the things I have learned I am too focused on bargains and I should be more willing to accept less of a bargain to get great management systems – so I have adjusted, and have improved my results. When I can get a great bargain and great management it is wonderful, though sadly a rare occurrence. Toyota’s price now seems reasonable, but not a huge bargain. The market continually gets overly excited by either actual problems or perceived problems. I wrote about this happening with Netflix 2 years ago. Netflix made some mistakes and faced some tough business issues. The evidence of sound, sensible, effective management vastly outweighed the evidence for management failure – yet there were hundreds of articles about the pitiful failure of Netflix management. This entry was posted in Data, Economics, Investing and tagged business, commentary, Investing, leadership, stockholders, Toyota on January 28, 2013 by John Hunter. When confronted with the challenge of managing a social system (or market) I like to find ways to use a few simple rules that will guide the system to find improvements. I favor allowing participants in complex social system to determine how to adapt. So I support, for example, a carbon taxes where the market can decide where it is most effective to invest to reduce carbon use (both to reduce our depletion of the resource and to reduce pollution leading to climate change). I like to try and keep prescription rules as limited as possible and instead set simple rules that will allow people to make choices. These rules will often allow for people to judge when they need to temper the extremes (in management examples) and in economic situations they often can have costs that escalate as the system is strained (so low pricing if the road is currently not heavily used and increasing the cost to users as congestion increases). The more prescriptive the rules the less ability people have to find creative solutions. Traffic congestion is a perennial problem with high very costs to society. I very much like congestion pricing. You set a rule that puts increasing costs on those creating an overload on the system (which has costly negative externalities). Then allow people to figure out how to adapt. The video also provides a very good example of why leadership is important. In Stockholm people were against congestion pricing (70% to 30%). This isn’t surprising they see a new tax that only is a cost. They don’t understand that the system performance is going to improve – the cost will provide a benefit. Leadership is required to push forward when the benefits are not obvious to everyone. Once people saw that congestion was greatly decreased 70% supported congestion pricing. This entry was posted in Creativity, Economics, Public Sector, Systems thinking and tagged Creativity, Economics, leadership, Systems thinking on December 5, 2012 by John Hunter. Management and the economy keep evolving. Many good things happen. In the last decade the best things are probably the increased deep adoption of lean thinking in many organization. and the adoption of lean and Deming methods in software development (agile software development, kanban and lean startup [which I do realize isn’t limited to software development]). In my view these 2 diseases are more deadly to the overall economy than all but the broken USA health system. The systemic impediments to innovation are directly critical to small percentage (5%?) of organizations. But the huge costs of the blocks to innovation and the huge “taxes” (extorted by those using the current system to do the oposite of what it should be doing) are paid by everyone. The costs come from several areas: huge “taxes” on products (easily much greater than all the taxes that go to fund our governments), the huge waste companies have to go through due to the current system (legal fees, documentation, delayed introduction, cross border issues…) and the denial of the ability to use products and services that would improve our quality of life. The problems with extremely excessive executive pay are well known. Today, few sensible people see the current executive pay packages as anything but the result of an extremely corrupt process. Though if their personal pocketbook is helped by justifying the current practices, some people find a way to make a case for it. But excluding those with an incentive to be blind, it is accepted as a critical problem. More people understand the huge problems with our patent and copyright systems everyday, but the understanding is still quite limited. Originally copyright and patents were created to provide a government granted monopoly to a creator in order to reward that creator for contributing to the development of society. Copyrights and patents are government granted interventions in the free market. They are useful. They are wise policy. This entry was posted in Creativity, Deming, Economics, Innovation, Lean thinking, Management, quote, Systems thinking and tagged Creativity, curiouscat, Deming, executive pay, Innovation, John Hunter, lean management, lean manufacturing, overpaid executives, Systems thinking on August 29, 2012 by John Hunter. Marketplace looks at the Apple economy in China. Marketplace is an excellent source of actual journalism; rare in the post Bill Moyers days, sadly. Yet it is: as you walk beyond the civic center of Longhua, the buildings begin to change. From a management perspective there is a great deal to be desired in Apple’s manufacturing practices. The economic perspective however, for me, provides a much different picture than those in rich countries (USA, Europe, Singapore, Japan…) often feel. The jobs provide workers a chance to earn what for them is a great deal of money. Yes the conditions are harsh – I wouldn’t want to have to work there. But I am pretty sure I would not be happier, if I lived in China, and everything else remained the same in China except now all the Apple products were made in Singapore, USA and Spain. This entry was posted in China, Economics, Manufacturing and tagged Apple, China, Economics, Manufacturing on April 15, 2012 by John Hunter. Bob Lutz, the former head of GM, says it was neither uncompetitive wages nor unions that drove the Big Three into decline. It was a management with its eye focused on the bottom line and the short term. That sentiment should be familiar to students of Deming (it is one of Deming’s 7 deadly diseases). It is sad that this bad management practices, short-term thinking, continues to do harm several decades later. Hopefully we can do better in the next few decades. retiree health care and pensions — burdens that are borne by society, not manufacturing plants, in every other advanced country. That disparity, the result of policy decisions made in Washington rather than wages negotiated by the United Auto Workers, was the source of most of the labor-cost advantage enjoyed by foreign companies. The excessive health care costs in the USA, another of Deming’s 7 deadly diseases, has continued to get worse every year since he classified it as one. The damage that the failed health care system in the USA does to the USA is enormous. This entry was posted in Deming, Economics, Manufacturing and tagged cars, Deming, economic data, economy, lean manufacturing, Manufacturing, Toyota, USA on February 6, 2012 by John Hunter.